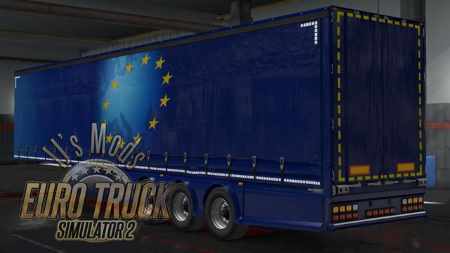 This mod contains a custom Owned Trailer based around the SCS trailer. Supports 3 & 4 axle variations. SDC like painted rear bumper. Painted SCS Euro3 and Eco rear bumpers. Custom marker (side) lights that double as indicators. Marker (side) light slots to allow custom small lights to be used. A pack of my LED/Strobe lights. Custom LUX wheel rims, Inverse and Edge Only options. Aero sideskirts – as chassis option. White —- Red with squares. White —- Red cut with squares. Yellow —- Red with squares. Yellow —- Red cut with squares. White —- Yellow with squares. White —- Yellow cut with squares. Yellow —- Yellow with squares. Yellow —- Yellow cut with squares.